Hiking, mountain biking and horseback riding are accommodated on a trail system that also gives access to backcountry campsites. Rugged terrain offers trail segments that are moderate to strenuous, but there’s an accessible, educational along the Jacob Fork River. Location: Connects Lower CCC Trail to Raven Rock Trail. Closest access is 5 mi from the Jacob Fork parking area. The trail serves as a boundary between North Carolina gamelands and the park. Benn Knob Peak is a restricted area. Point of Interest: Benn Knob is one of the highest peaks in the park. Location: Starts off of High Shoals Falls Loop Trail, 0.2 mi from the Jacob Fork parking area. The trail ascends 1.2 miles to a scenic view of High Shoals Falls and Hugo Rock. It continues another 1.4 miles up to Chestnut Knob Overlook. This rock outcropping offers a beautiful view of the Jacob Fork Gorge. Point of Interest: View of High Shoals Falls, Raven Rock and Hugo Rock. Beautiful view of the South Mountains range from the top. Location: Starts at the Clear Creek Dam. This “out and back” trail starts at the Clear Creek Dam and ascends into the Clear Creek Watershed for a quiet, reflective retreat into nature. The Clear Creek Access area is open from sunrise to sunset. Point of Interest: The 22 ac. Clear Creek Lake is adjacent to this trail. Location: Connects Lower CCC Trail to Raven Rock Trail. Closest access is 4.1 mi from the Jacob Fork parking area. 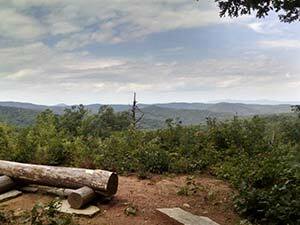 This remote trail has an expansive vista of the Blue Ridge at the eastern end of the trail. It descends to Nettle Branch and then winds around mountains ridges. Point of Interest: A confederate soldier’s grave is located at the western end of the trail near the Fox Backcountry Campsite. Location: Starts at the Shinny Creek picnic area, 0.5 mi from the Jacob Fork parking area. The trail provides access to Shinny Creek Trail, the Shinny Creek Backcountry Campsite and the Upper Falls Trail. Point of Interest: One of the main artery trails which provides access to many other trails and backcountry camping areas.